AT rock hound Kerry van der Jagt steps back in geological time to investigate WA’s curvy curiosity. SHORT ANSWER // In the wheatbelt of WA the surf’s always up. Near the small town of Hyden about 350km southeast of Perth, a giant rock resembling a wave about to break looms 15m above the ground. LONG ANSWER // You’ve no doubt heard of a Mexican wave, a royal wave and even a tidal wave, but what about a rock in the shape of a wave? Wave Rock is believed to have formed 2700 million years ago (well before dinosaurs strolled around) and the 110m long curved cliff face is part of the north face of the remnant Hyden Rock. Hyden Rock is an inselberg made up of variably textured, medium and coarse-grained porphyritic granite (igneous rock with embedded crystals). Inselbergs are created by the erosive action of wind and water over millions of years, and Wave Rock’s distinctive shape has been caused by erosion of the softer rock, which has undercut the base and left an overhang. The red, brown, yellow and grey vertical stains on the rock are caused by rain washing chemical deposits (iron oxide and carbonates) down the surface. These coloured ribs look hand-painted and add to the wave-like appearance. As you stand beneath the wave you’ll feel all the power of an ancient rock poised to crash over you. There are other interesting formations within the Wave Rock Reserve, including King Rocks, the Hippo’s Yawn, The Humps and Mulka’s cave. According to Aboriginal legend, Mulka was the son of a woman who fell in love with a man with whom marriage was forbidden. As a result she gave birth to a son with crossed eyes. Even though he grew to be a huge man, his crossed eyes prevented him from throwing a spear accurately and he couldn’t hunt. It’s said “Mulka the Terrible” turned to catching and eating children, and became the ogre of the region. He lived in Mulka’s cave, where the imprints of his huge hands can still be seen (wouldn’t recommend this as a bedtime story, but you could certainly have fun with it). You probably knew //Speaking of waves, in 1914 the Hawaiian Duke Kahanamoku brought surfing to Australia when he gave an exhibition of wave riding at Freshwater Beach in Sydney. But did you know // Approximately three million Aussies take to the waves each year. And did you also know // The largest wave ever ridden in Australia was by 43-year-old Damon Eastaugh near Margaret River in July 2006. Judges estimate the wave was between 14.5m and 16m. 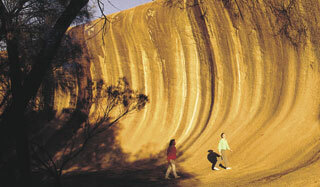 That’s close to the height of Wave Rock.